for the second atmospheric Grand Prix in a row for the FIM Motocross World Championship, and Monster Energy Dixon Racing Team Kawasaki’s Max Anstie salvaged fifth place in the second moto from a testing weekend. Hard-pack and hills combined with a tight layout and a short lap; Villars was a very different challenge to Matterley Basin the previous week and with some ill-advised watering before the start of the MX2 motos created a difficult racing surface. The team headed to western France with Anstie the sole representative and endured a few unexpected and unusual technical problems on Saturday that meant the Brit entered the gate down in 36th position for the motos on Sunday. Max was wary of the conditions in the first moto and was unable to make gains on the opening laps. At one stage he was a low down as twentieth before finding some speed and passing opportunities to rise to eleventh by the chequered flag. Anstie was more lively and reactive at the start of the second moto: a period in which the French soil was at its roughest and most technical for the MX2 brigade. ‘99’ found a top ten slot and began cutting ground to Jeremy Seewer, actually passing the Swiss to breach the top five and bag sixteen points and sit ninth overall for the Grand Prix. Monster Energy DRT Kawasaki will make the short trip up through France and across the Channel back to their UK base this week. There are only a few days before the rig has to push up to Shropshire and to Hawkstone Park for the fourth round of the Maxxis British Championship. 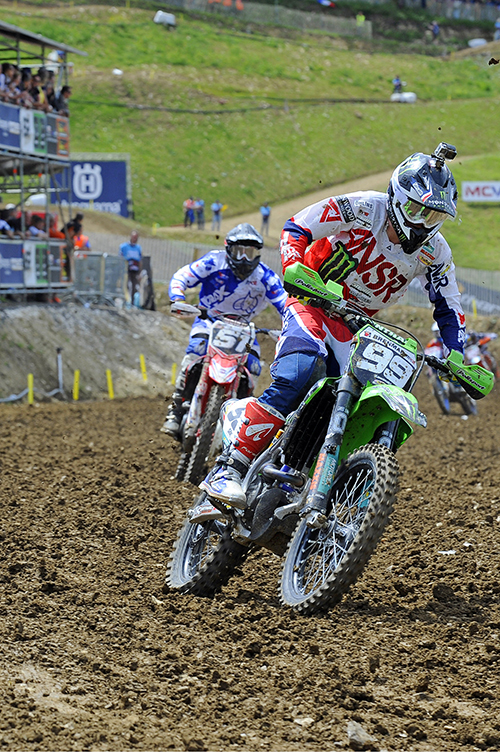 This entry was posted in Home and tagged 2015, bike it, cosworth, fim, france, kawasaki, max anstie, motocross, mx2, steve dixon, villars sous ecot, youthstream on 1 June 2015 by admin.